Sarah Pye Creates large impressionist paintings ,freely and intuitively, with nature’s colour, light and life always foremost in her mind . Sarah Drops, dribbles and splashes acrylics, some of which are almost pointillist in appearance. Painting dappled woodland lights, atmospheric moorland scenes , vibrant coastal views or an explosion of wildflowers, appreciating work from the likes of Monet, Henry Edmund Cross and Klimt. Growing up on Devonshire beaches and working outside for 15 years as a Gardner, seeing and feeling the seasons change and nature’s responses. 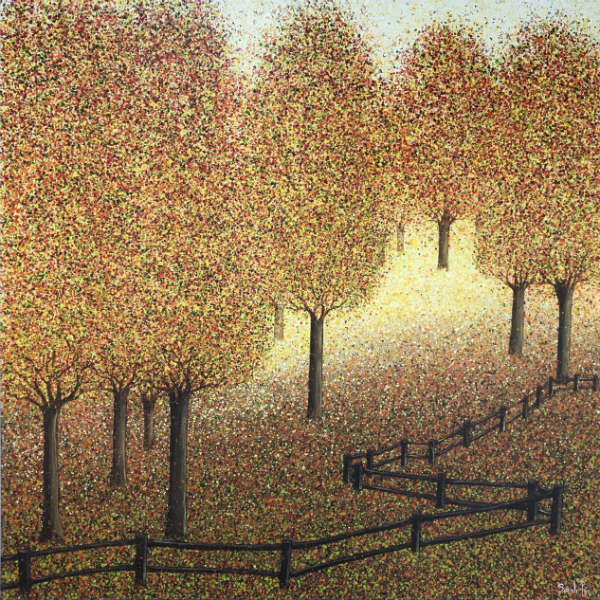 Her paintings are a visual interpretation of natural emotions felt, when seeing nature’s boundless beauty........ Painting professionally for the last decade , her studio is just outside Henley -on-Thames. Sarah has work overseas and collectors across the country. Exhibiting in galleries throughout the south of England and showing her paintings at various national events during the year .